​Apart from putting bird feeders out, we don’t often think about the importance of the backyard habitat for wildlife in winter. No matter where you live, your backyard habitat (which includes food, water, shelter, and space) can be critical to wildlife survival. One of the most popular ways to attract winter wildlife is the bird feeder. Birds keep their bodies warm by shivering and using fat reserves, which requires a lot of energy from food. Keep feeders full, and clean by washing with bleach at least once every week or so, to keep diseases from spreading. Provide suet and a variety of food sources in different types of seed-feeders. A great way to provide food, as well as shelter and structure, is with native shrubs and trees that provide berries, nuts, or seeds. Eastern red cedar is a favorite of cedar waxwings. Squirrels and other small mammals eat eastern white pine seeds. Black-capped chickadees and ruffed grouse eat eastern hemlock seeds. Deer and other mammals eat soft fruits like persimmons or wild grapes that may persist through the winter. Wildflower seeds from rudbeckia (Black-eyed Susan), goldenrod, and native roses can be important sources of nutrition. Birds and other wildlife need access to water in winter or they risk dehydration. Provide clean, unfrozen water for your backyard visitors by trying a heated bird bath or changing water often. Shelter and structure are important to wildlife. Consider providing safe, protected refuges at various levels for wildlife. Conifers provide thermal cover in the winter since they do not lose their needles. Other forms of cover include brush or rock piles. They can be as small as a few feet wide but can provide shelter for garter snakes, lizards, salamanders, and toads. By avoiding cutting back vegetation in the fall, and leaving your yard a bit “messy,” you can provide structure. Amphibians and small mammals can hide under unraked leaves and ground covering plants. Birds make use of seed heads left on flowering plant stalks, and other birds and mammals will use taller trees and shrubs. Providing structure at varying heights gives more places for prey to hide from predators, too. As a bonus to providing winter habitat, these beneficial critters are likely to frequent your yard in the spring and summer, as well. If you have neighbors, consider partnering to create complementary wildlife habitat throughout the neighborhood. Connecting hedgerows with neighboring brush piles is a method to expand backyard wildlife habitat. One neighbor may be able to provide water, while you may be able to provide conifer cover, for example. 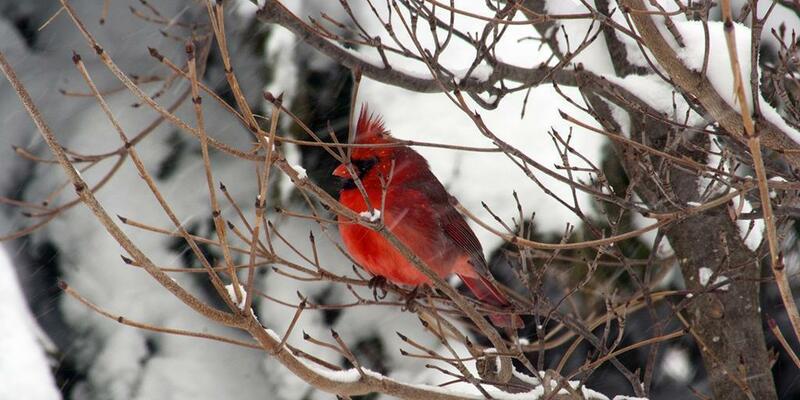 Your backyard efforts could help sustain wildlife throughout the winter. To learn more about conservation practices you can try at home, visit the iConserve PA website, and follow iConserve PA on Facebook and Twitter. If you have questions about managing your woods and strategies on your forestland, contact your county’s service forester (PDF) for advice or reach out to DCNR’s Bureau of Forestry.